Along US-93 in Polson, Montana, a large number of accidents are caused by deer, bears and other wildlife crossing the highway. A multi-phase project launched by the MDT, the Federal Highway Administration and local Native American tribes was put into motion that included several wildlife crossings along the corridor. In 2006, the first phase of the project included installation of SUPER-SPAN™ high profile arches with Keystone® end treatments. 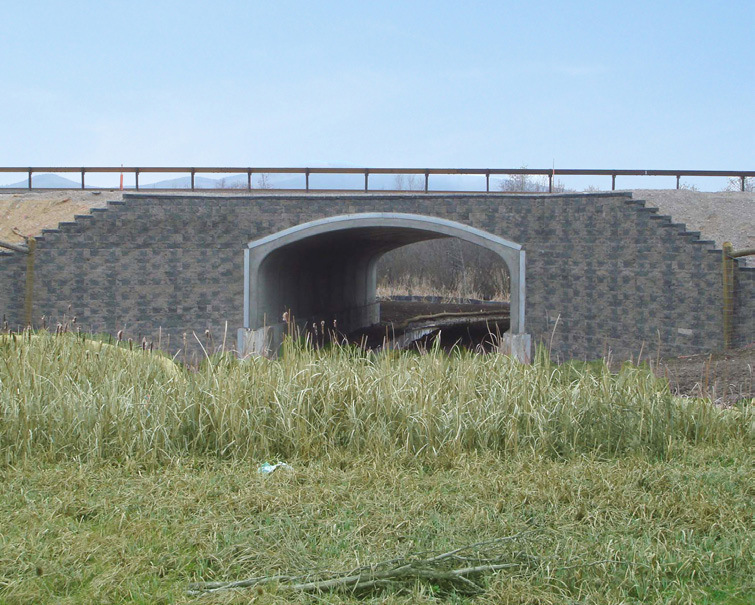 Additionally, three CON/SPAN® structures with Keystone® end treatments were installed to encourage wildlife to cross under the highway. During the installation, MDT required two lanes on US-93 be open at all times to accommodate the flow of traffic. Crews also encountered the challenges of high groundwater and working in close proximity to protected areas such as wetlands and culturally significant Native American lands. MDT and the tribes wanted all work completed within one year. Schellinger crews worked in two shifts, nine hours each for six days a week. Ongoing phases will include additional wildlife underpasses along US-93.